This is one of the most common neurological conditions in dogs and it also affects cats occasionally as well. The reason for disc disease being such a common problem in dogs is related to the process of miniaturization that occurred in the canine population once they became domesticated. This process has been associated with a number of side effects. One of these side effects is that many of the dwarf breeds suffer from premature aging of their intervertebral discs. A disc has two main structural components. There is a tough, outer fibrous layer that gives the spine strength and flexibility and that also keeps the inner, jelly-like nucleus of the disc under pressure. This design of intervertebral discs is ideal for their main function of absorbing and cushioning the forces acting on the spine. However, in miniaturized breeds of dog the nucleus of the disc ages prematurely such that even in young dogs the nucleus becomes calcified and loses its jelly-like consistency. As it solidifies the nucleus is less able to act as an efficient shock absorber and this, in turn, causes the outer fibrous layer to fail. The problem is exacerbated because young animals are often very active and tend to put high stresses on their spines. Early degeneration of the disc helps to explain why the peak incidence of disc disease in dachshunds is between three and five years of age. This situation is analogous to that seen in human dwarfs who suffer from a peak incidence of disc disease in their late teens and early twenties. Miniaturization of dogs takes many forms and perhaps the most extreme examples are the Pekinese and Shi Tzu. These breeds not only have short, bandy legs but they also have a foreshortened face. The peak incidence of disc disease in the Shi Tzu is even earlier than in the dachshund and occurs between one and two years of age. Even breeds such as the beagle and the Bassett, which are miniaturized forms of foxhound and the cocker spaniel, which is a miniaturized spaniel, are predisposed to disc disease compared to their parent forms or to a non-miniaturized breed such as a German shepherd. Disc disease does occur in large breed dogs but here the age incidence is similar to that found in most people i.e. from late middle age onwards. There are three main locations affected by disc disease. One type occurs in the neck and is usually called cervical disc disease (see Figures 6A & B, below ). The other type is when the disc disease occurs in the thoracic and lumbar spine (see Figure 7-1, below ). A third type occurs at the base of the lumbar spine and is called lumbosacral disc disease. This is discussed separately under Lumbosacral Disease. The main sign of disc disease in the neck is a severe and often unrelenting pain. This is one of the few conditions that cause animals to scream out spontaneously, even if they only think that someone is going to touch them. In more severe cases there may be a weakness of one front limb. Some animals will develop weakness in all four limbs due to compression of the spinal cord. Severe neurological deficits such as this are not very common in cervical disc disease compared to thoracolumbar disc disease, due in large part to the relative sizes of the bony vertebral canal inside which the spinal cord is contained. Figure 6: A. CT scan of a dog’s neck to show a normal disc space at C3-4. The arrow shows the vertebral canal, which is the hole that the spinal cord runs through. B. The normal scan at C3-4 contrasts to the adjacent C4-5 space where there is a large disc extrusion (arrowhead). As the pain is hard to control with medical therapy in many dogs, surgery is the preferred treatment option. The prognosis is very good for most dogs with cervical disc disease if they undergo surgery. Dogs that are so weak that they cannot stand to have a more guarded prognosis with or without surgery, as they are more prone to complications such as pneumonia. The most common complication is that some dogs will have continued neck pain for one to two weeks after surgery. The signs of thoracolumbar disc disease differ considerably between humans and animals. This is because herniated discs in humans occur mainly in the low lumbar area, which is occupied by nerve roots and not by the spinal cord. In dogs, however, the spinal cord extends much further down the spine, and, in addition, most disc herniations in animals occur in the area of the last ribs. Therefore in contrast to humans, in dogs and cats, most disc herniations compress the spinal cord and so cause varying degrees of weakness in the rear limbs. This is distinct from the pain without significant weakness that occurs most commonly with nerve root compression due to disc herniations in humans. Diagnosis of disc disease is rarely possible using X-rays alone. Many dogs, even those without clinical signs, have changes on X-ray that suggest disc degeneration. Definitive diagnosis, therefore, requires either myelography, CT or MRI. Myelography used to be the standard diagnostic technique but this is an invasive test requiring the injection of a contrast agent around the spinal cord. Myelography has been superseded by either CT or MRI where available, as these newer tests are non-invasive and also very accurate at identifying herniated disc material. Figure 7-1: CT scans made at of level of the end of the rib cage. 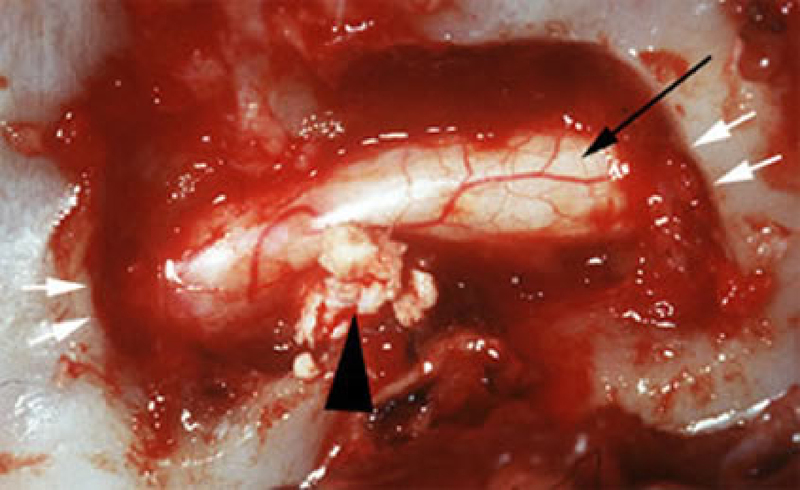 A: A normal dog to show the spinal cord surrounded by fat and bone (arrow). B: A dog with a large disc extrusion (arrowhead). Figure 7-2: Longitudinal (also termed sagittal) MRI of a dog with a large disc extrusion that is evident as a dark mass (indicated by the white arrowhead) situated just in front of the last rib. The spinal cord is shown as the medium dark band extending the length of the image (indicated by the *). 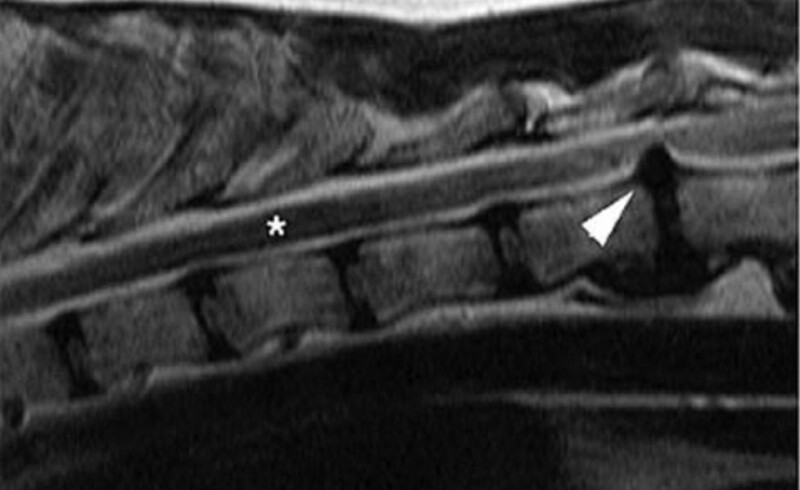 Figure 7-3: Cross-sectional images of a second disc extrusion in the same dog to show compression of the spinal cord. A: The spinal cord is normally surrounded by a fluid-filled space containing CSF that appears white in this image (arrowhead). The darker, bean-shaped spinal cord is sitting in the center of this space. B: A dark mass of herniated disc material (arrowhead) has compressed the spinal cord and deformed it to one side. The pressure caused by the disc material has also shut down the fluid-filled space and pushed away the CSF so that the spinal cord is no longer surrounded by the white halo shown in A. Relies on rest to allow the associated inflammation to resolve and to prevent the herniation of further disc material. Strict rest needs to be maintained by keeping the dog in a small cage for 6-8 weeks and then preventing it from running or jumping for a further month after that. It is necessary to continue rest for this long period because a disc takes on average about twice s long as a broken bone to heal, as a disc has a very poor blood supply compared to most other tissues including bone. Despite being confined in this way some animals will continue to deteriorate and lose sensation in their rear limbs. Overall about 70% of dogs that are weak or paralyzed in their rear limbs will make a good recovery after non-surgical management provided that they have good sensation in the affected limbs. Overall recovery times for these dogs vary from 6 to 12 weeks before they can walk. Physical therapy must be limited during this time so that the dog can be rested properly. Some dogs that respond only make a partial recovery after severe injury while others never recover. A significant proportion of dogs in this category will be left with mild, residual neurological deficits such as wobbliness of the rear limbs. About one-third of the dogs that recover suffer a second episode of disc disease later in life. Non-surgical management is not effective for dogs that have lost sensation to their rear limbs. Only about 5% of these dogs make a good recovery. Recovery of spinal cord function after non-surgical management depends mainly on the dog compensating for any nervous tissue that has been damaged irreversibly. NB. Recovery is defined as being able to walk and regain control of urine and feces. Figure 7-4: Photograph of the spine of a paralyzed dog undergoing surgery to remove a disc extrusion. A bone of the spine has been removed in a procedure called a hemilaminectomy. The white arrows show the edges of the bone that has been removed in order to expose the spinal cord (small black arrow). This procedure permits the surgeon to remove the large mass of mineralized disc material (large black arrowhead) that is the cause of the paralysis. Requires myelography, a CT scan or an MRI in order to identify the symptomatic disc. A window is drilled in the bone(s) of the spine in order to remove the extruded disc material (see Figure 7-4, above). A procedure is usually done at the same time to reduce the risk of recurrence at other disc spaces in the future; this procedure is called a fenestration. Overall about 95% of dogs that are weak or paralyzed in their rear limbs will make a good recovery after surgical management provided that they have good sensation in the affected limbs. Recovery times for these dogs vary from 1 to 4 weeks. Surgery should prevent further deterioration and is associated with a low complication rate. Physical therapy can be instituted immediately after surgery, which hastens recovery. Most dogs have minimal or no residual neurological deficits after surgery. Only about 5% of dogs suffer a second episode of disc disease after surgery. Surgical management is, therefore, the treatment of choice, especially for dogs that lose sensation to their rear limbs. About 50-60% of dogs that initially lack sensation in their rear legs will make a good recovery after surgery, although they may have residual wobbliness and in some cases a mild disturbance of continence as well. The most common complication after surgery is the fact that many dogs will develop urinary tract infections until they regain the ability to urinate normally (this also occurs in dogs that do not undergo surgery). About 5-10% of paralyzed dogs that present without pain perception fail to recover because they develop a fatal condition called myelomalacia where their spinal cord loses its blood supply; unfortunately, this usually develops only after surgery has been performed. Disc disease in cats is less common than it is in dogs and usually occurs only in older animals. Signs are similar to those seen in dogs although sometimes cats with this problem do not show back pain as clearly as do most dogs. The principles of diagnosis and treatment are the same as for dogs. Client Education. College of Veterinary Medicine. University of California, Davis. The computed tomographic appearance of acute thoracolumbar intervertebral disc herniations in dogs. Olby NJ, Munana KR, Sharp NJ, Thrall DE. Vet Radiol Ultrasound. 2000 Sep-Oct;41(5):396-402.